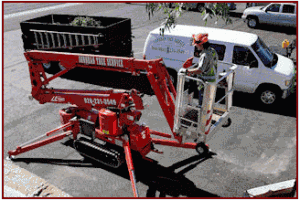 Our 60ft Mini-lift can access most trees – it can drive through a standard 3ft door-sized space! Its gray rubber tracks won’t harm grass or pool decks. Working from a lift is faster and safer than climbing, which allows us to be more efficient and affordable! Our lift has an AC (electric) power option for indoor work and we’re available for this and other rental services. Our Mini-lift is perfect for glass contractors, signage, changing light bulbs, caulking, etc, whenever you’ve got to access extreme heights in tight spaces.